Having a little extra outdoor space in the form of a balcony, veranda or roof terrace instantly adds to the appeal of any house. This is particularly true in densely-populated cities such as Hong Kong, where most people live in a flat and that might well be the only open-air space that you have. It’s all the more important, then, to truly make the most of those outdoor areas, making them into an additional room for your home. The photos included here come from all over the world, but all have one thing in common: the designers and owners of each home clearly recognise the value of outdoor space, however large or small. 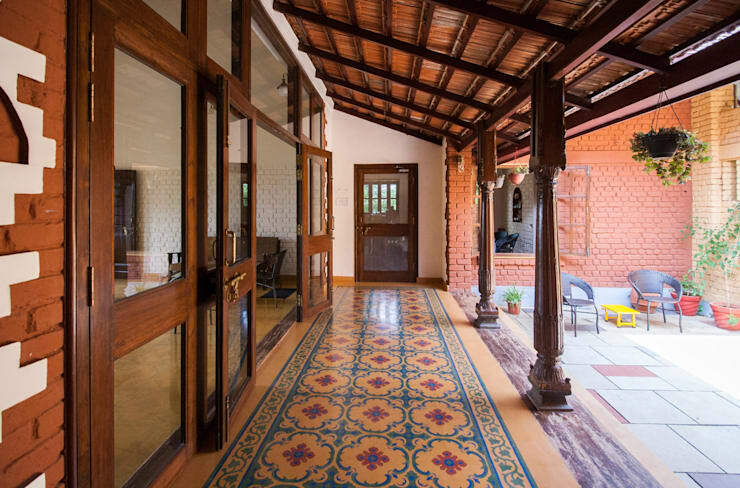 The patterned flooring of this veranda helps create the sense that this is an extension of the indoor space. When combined with the homey, comforting wood supports and roof beams, the whole effect is a very laid-back and downbeat one. The risk with a covered veranda such as this is that it will diminish the amount of light reaching the interior of the house, but the architect of this building has come up with a solution to that potential problem by installing glass doors and big windows all along the wall. This allows in plenty of light, whilst also contributing to blurring the lines between indoors and out. 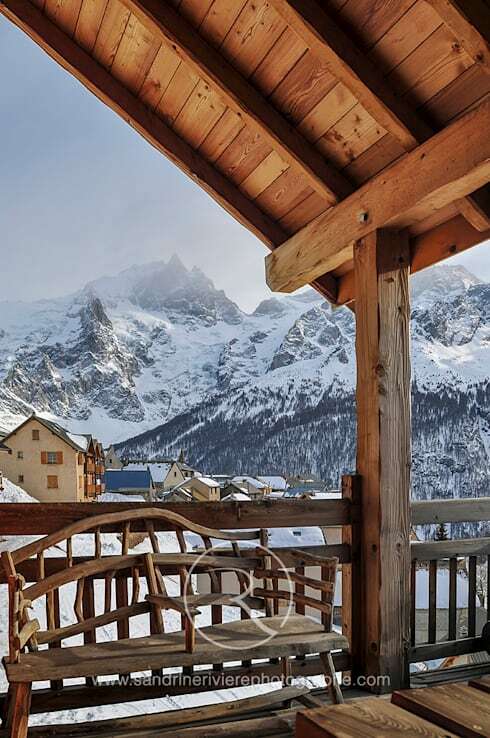 This balcony has gone back to basics, staying true to the rustic theme most suited to the incredible mountain view we can see in the background. As you would expect, everything is wooden here – including the unusual bench made out of natural, unfinished branches. This is the perfect look for a countryside retreat. We would assume no smartphones are welcome in this cottage. 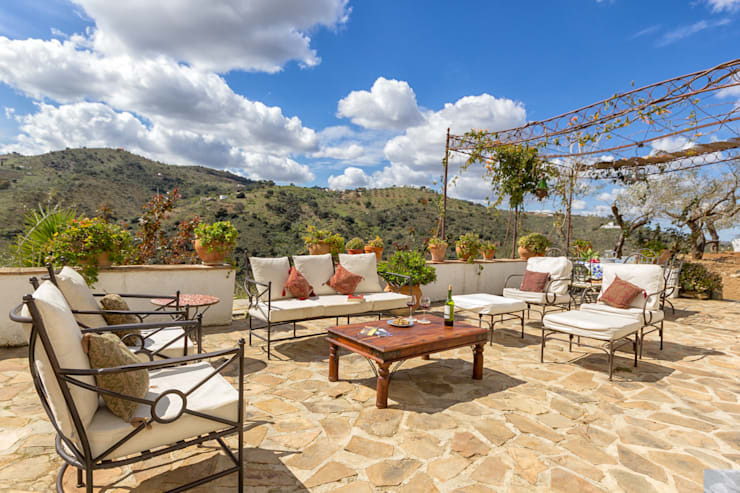 This gorgeous roof terrace, set against a lovely backdrop of rolling hills, seems almost too good to be true. We might not all have the weather and the scenery to replicate this, but there are parts of this look that it would be possible to take inspiration from. For example the relaxed, comfortable seating and low table offer good alternatives to the uncomfortable upright furniture often used outdoors. 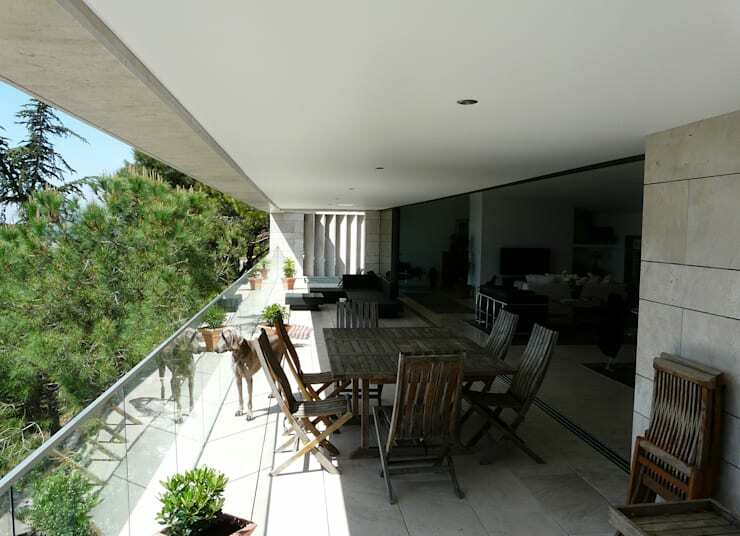 Its roof means that this balcony is always half in the shade, but the use of a transparent barrier maximises the amount of light that gets in so that at least there is a little sunshine. The ladder-like structure of the roof seen here would provide beautiful alternating sections of light and dark. Again, the glass barrier lets light in from all sides. 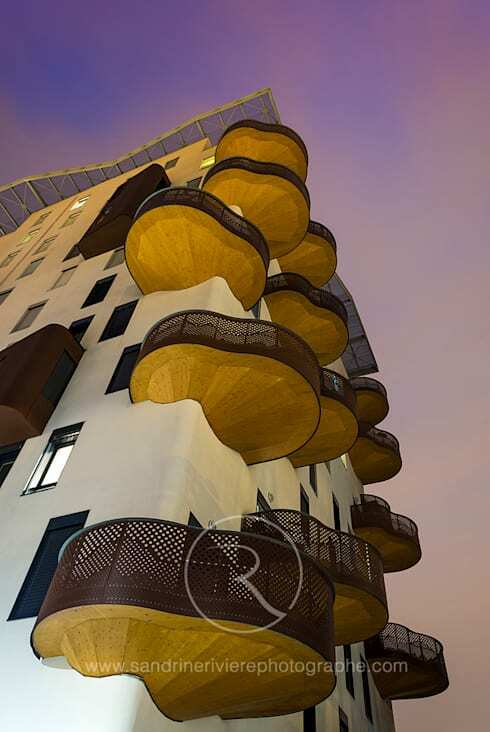 Clearly drawing inspiration from nature, these beautifully odd balconies resemble fungus growing on bark. Their wiggly lines and irregular shapes make this building into something a lot more playful than it would otherwise be. 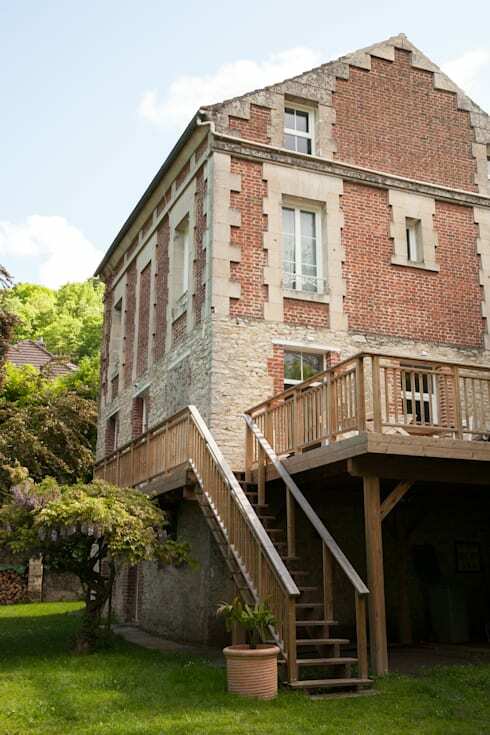 Adding a large terrace area midway up this beautiful old building was an inspired use of space. The result is a perfectly summery outdoor seating are that enhances the overall look of the house, and a shaded storage area below that could be used for bikes or other bits and bobs. Never underestimate the importance of a good cushion – especially when it comes to rooftop lounging. 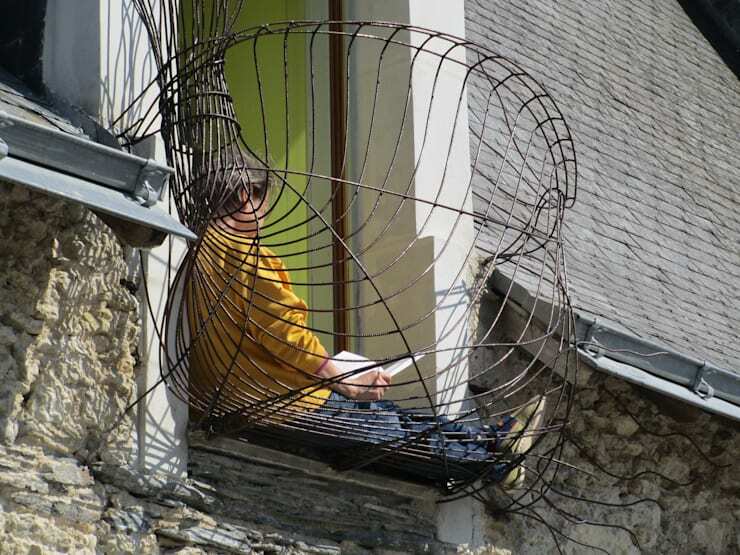 This wire mini-balcony may take some getting used to, especially if you’re not great with heights. But once you’ve got over your vertigo, this would be the ideal spot to while away a weekend with a good book.